Delaware Arts Info: Hello, Dolly is Back Where She Belongs! Hello, Dolly is Back Where She Belongs! The Brandywiners’ 81st production is the iconic Jerry Herman and Michael Stewart Broadway musical, Hello, Dolly! The expansive Longwood Gardens’ Open Air Theater allows this musical extravaganza to come alive! 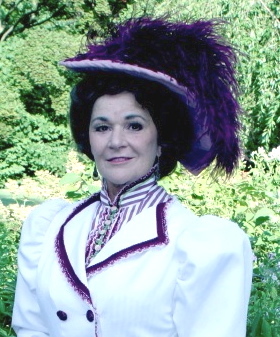 Based on the play The Matchmaker by Thornton Wilder, Hello, Dolly tells the story of the larger-than-life matchmaker and jack-of-all-trades Dolly Gallagher Levi (played by the charismatic Sue Hornung). After the passing of her husband, Dolly has become the go-to woman in New York to find love. Although it’s the 1890’s, Dolly is an independent woman who’s not afraid to go after what she wants in life, including a grouchy, half-a-millionaire, Yonkers grocery store owner and widower, Horace Vandergelder (played by Ms. Hornung’s real-life husband, Tom Hornung). The two have great chemistry and give exceptional performances. Comic hijinks ensue as Dolly not only meddles in Horace’s life, but also his niece’s (Jenny Torgerson) life -- she’s in love with a struggling artist (Jeff Gorcyca) who Horace despises -- as well as the lives of Horace's employees’ (Alexander Bowditch and Chris Trombetter) -- two young men who disobey their employer and leave the store unattended to go to Manhattan for an adventure. While in the Big Apple the two men meet the women (Kate Connell Wright and Meghan Hindmarch) of their dreams. (Ms. Connell’s soprano voice is exquisite, especially in her act one ballad, Ribbons Down My Back.) With the help of Dolly, each characters’ life is forever changed! Cal Brackin directs a solid show with enthusiastic choreography by Jody Anderson. Ms. Anderson’s exciting choreography is at its best during the show’s title number, when Dolly leads the chorus members through a rousing dance sequence. In addition to the leads, the other star, as in every Brandywiners’ production, is the outstanding chorus! The chorus members don’t just back up the leads, but instead they join their voices together and make them soar throughout Longwood Gardens. While performing in 19th century costumes by Beverly A. Parnell and her committee, the chorus and the leads are a feast for the eye. Ms. Hurnung’s gowns and hats never disappoint! Although the story is a little dated, Hello, Dolly has a memorable score. The music keeps everyone entertained during the two-hour production! Going to see The Brandywiners’ is a summer tradition for most people -- for some since 1932. A wonderful tradition for the young and the young at heart to enjoy together! Hello, Dolly closes August 4. To order tickets, call 302.478.3355 or visit www.brandywiners.org. Entrance to Longwood is included with the show ticket, so go early to explore the gardens and/or dine at the restaurant or café. Summer Music "Reels" at Rockford!